Greetings Cards is a simple and productive way to get your holiday cards out to family, friends, and acquaintances this Holiday Season. 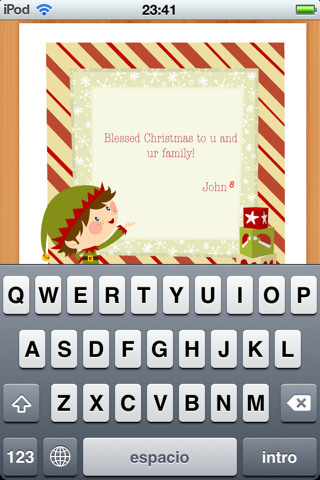 It is an app created by Juan Manuel Abrigo for an iPhone, iPod Touch, and iPad, and it costs $2.99. 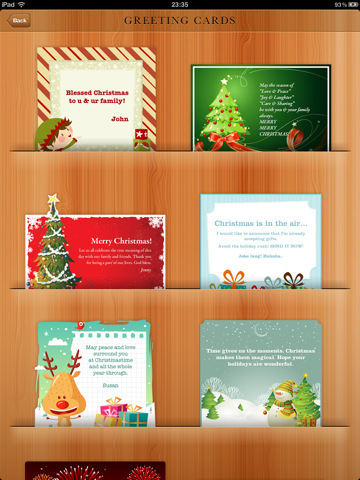 Greetings Cards provides you with 12 Christmas and New Years cards that are all designed differently. The cards are set up and ready to be customized. Instead of being able to change the graphics, you get the option of typing in your own message so that you can personalize each of the cards. All of the cards come with a preexisting message that you can choose to keep or change before sending them off. If you are impossibly busy and love doing everything electronically then Greetings Cards should suit you well. Each of the cards comes with a different style design and font that you can use which is the extent of the diversity offered. Some of the cards have a faint white font color that does not stand out from the illustration so that you can barely make out what the message is. There is only one card that is ambiguous and not directly a Christmas card so you have the option of sending out a non-religious greeting. The illustrations are beautiful, playful, delicate, fun, or festive so you have a broad choice of what you can send. I think the app is overpriced for the limited capabilities offered. There should be a variety of religions accommodated because the app is called Greetings Cards, not Christmas and New Years Cards. Another hindrance I found in using the app is that I cannot change the font color or style, which may be asking too much from an app, but it is nearly 3 dollars. Greetings Cards is the perfect app to buy if you are a person who has far too many friends, co-workers, and/or acquaintances to send holiday cards to, and not enough time. Spend a good hour using the app and you can send off hundreds of email, Facebook, Twitter, or Tumbir holiday messages, breathe a huge sigh of relief, and check an item off your Things To Do Christmas 2010 list. 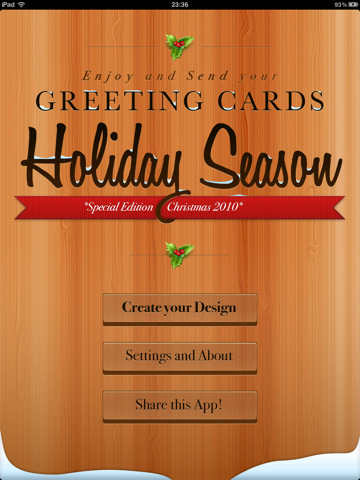 AppSafari review of Greetings Cards was written by Vanessa Paszterko on December 21st, 2010 and categorized under App Store, Art, iPad apps, Productivity, Social, Universal. Page viewed 5718 times, 1 so far today. Need help on using these apps? Please read the Help Page.